The long, thin hot dogs have natural casings, with a great snap when you bite into them. 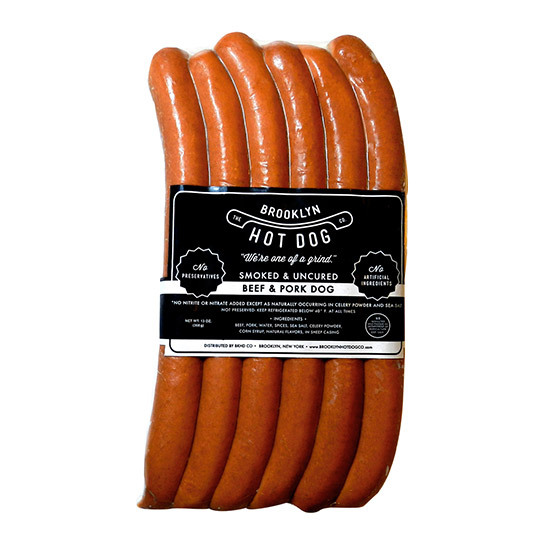 I was in a hurry a few weeks back, so I picked up a package of hot dogs from The Brooklyn Hot Dog Company to grill for a quick and easy dinner. I served them with a small array of fixings—kimchi, sauerkraut, fried onions and leftover aioli and ratatouille. The long, thin dogs have natural casings, with a great snap when you bite into them. Made with beef and pork, they reminded me of the lighter-style European hot dogs I grew up eating, which came in linked pairs from the butcher or, believe it or not, from a can. I looked at the packaging while I was cleaning up and was shocked to read the nutritional panel, which has the all-natural, no additives dogs weighing in at a light 70 calories and 3.5 grams of fat. The company also carries gyro, pepperoni and buffalo dogs, which I’ll have to try next time.